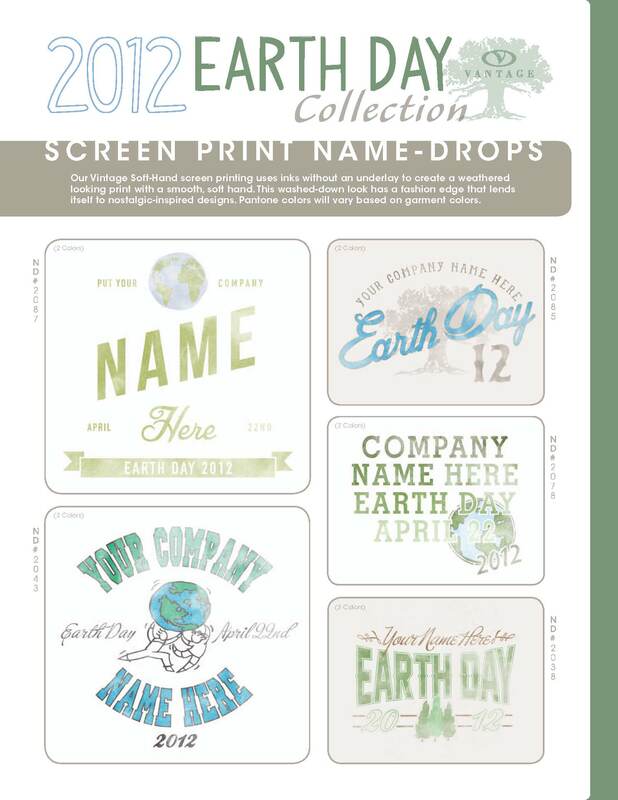 Once again Vantage is offering their Name Drop Graphics program for Earth Day Tees. So if you are looking to get the most design for your money on Earth Day shirts this might be the way to go. Decoration options include not only screen-printed designs but also Digital Print, Embroidery, Laser etching and Laser Applique. 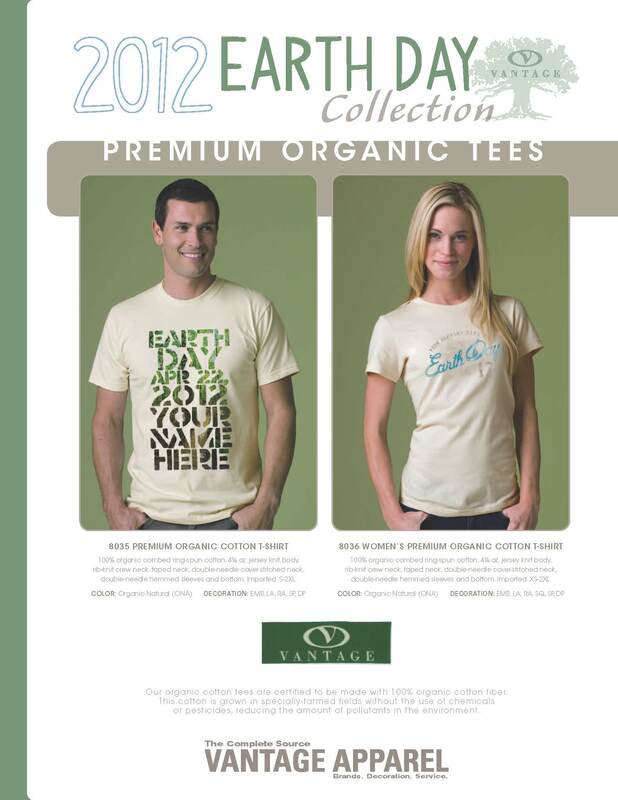 Vantage Apparel is one of the leaders in the industry for eco-friendly apparel, with a special focus on organic cotton t-shirts, sustainable fleece, and eco printing. With the introduction of these new imprinting methods the program has been expanded beyond just t-shirts, to jackets, fleece, bags, caps, pretty much any item the Vantage Apparel offers. Why use the Name Drop Graphics program? A lot of organizations want to make a big splash around Earth Day but may not have a budget for a big time design when it comes to organic cotton t-shirts and other apparel items. 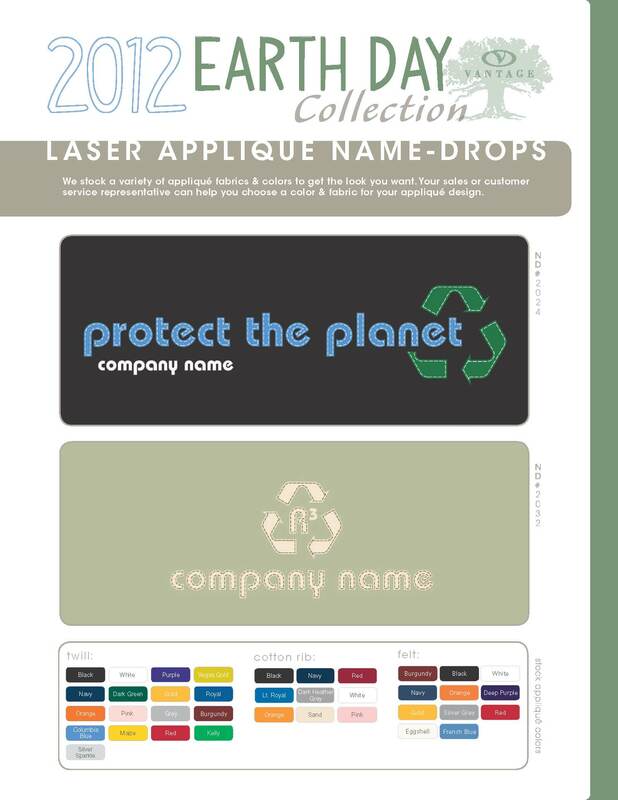 The Name Drop Graphics program makes getting a great design at a great price simple. 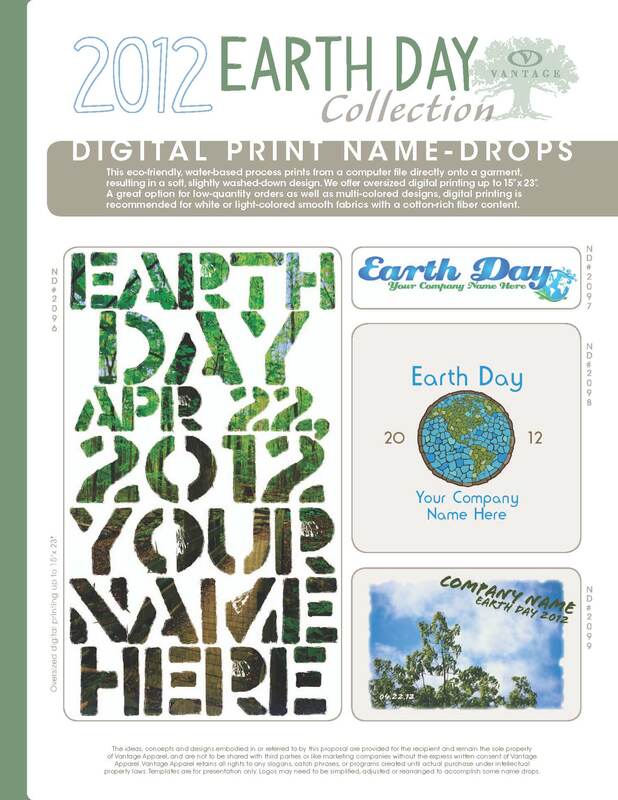 In a move I can only say is very ecopreneurial, Vantage is offer these Earth Day designs ready for the addition of your organization name or company logo. Just pick your design, your color, and your apparel item, and you are done. Runs start at as few as 12 units via digital printing methods and domestic runs can go as high as 10,000 units. Organic cotton and other eco-friendly materials are available as well as traditional fabrics. The plan is very practical in terms of matching the needs and budgets of all participants by finding the right mix of apparel options. Schools, clubs, city departments, charities, businesses, etc., for any and all this is a great way to make a big splash without having to fill the entire swimming pool out of your own pocket. Please note that Name Drop Graphics program for Earth Day is not mentioned on the Vantage website, so if you want more information on the program, including pricing, please email info@proformagreen.com. Or if you are in the promotional items business you can contact Julia Macdonald at Vantage.